Podcasting and blogging are great ways to get extended exposure in your target market. And while guest blogging and being a guest expert on podcasts have similarities, there are some distinct differences. 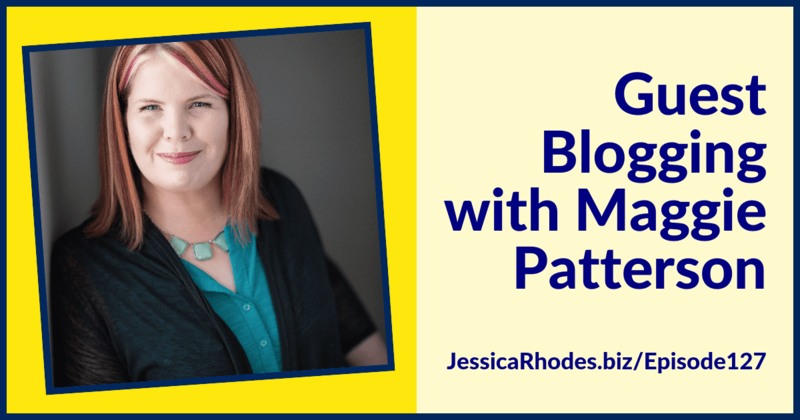 Maggie Patterson joins Jessica today to discuss those differences, and shares how to make the most out of both platforms to increase your brand and business exposure. Maggie Patterson is CMO of Scoop Industries. She is a Communications Strategist with 15+ years of experience, and co-host of the Inside Scoop podcast. She has been published in Fast Company, Virgin, and other major publications, and earned Master-Level Content Marketer status. Maggie says a blog has a crucial place in most businesses. There is a lot of competition within the blogging community, which makes a good guest blogging gig hard to get. To ensure your content is accepted on an established blog, it is best to plan ahead. ● Start small to build your body of work. ● Build a relationship with the blog owners. ● Learn to accept feedback from editors. ● Explain how you can serve the blog owner and their readers. Blogs that accept guest posts are particular about the content they publish, and they normally have guidelines for guest posts on their website. If there are no previous guest posts on a site they may not accept guest posts, so you will need to build a relationship with that person first. Guest blogging spots may be hard to get! Are Bigger Sites Better for Your Content? Some blog writers believe guest blogging on the top media sites will increase their traffic and leads. Maggie recommends going after a source that best fits your target market, but may not be as prestigious. Your target marketing should be your focus. Guest posting is commoditized. Don’t do it for the glory. If your request is accepted, ask the outlet for a style guide or format guidelines. Having word count, bio and link information will position you ahead of the competition. Once you have your guest post published you should do your part to promote the post as well. Share it with your social channels. Guest bloggers can reuse the content but they should approach the subject from a different angle every time. People want original content, so be creative. The internet has changed the standard for writing, and has relaxed grammar rules. The public digests information online differently than in a newspaper or book. Subheadings, bullets, and short paragraphs make reading easier. Bloggers should emulate blogs they enjoy reading. Maggie recommends writing your own posts, at the beginning. If you add a different point of view too early, you could damage your brand. If you are going to outsource the task of brand exposure you should be 100% confident that service provider knows what they are doing, and they do their research. Make sure your audience knows you before adding someone else into your lineup. Scoop Industries provides service-based businesses strategy and implementation assistance, and content and blogging strategy services for companies who want to grow more, but have done what they can on their own. It is important for new and established businesses to go to the right experts, for the right things. Today’s sponsor is the marketing and business building Dream Business Academy Live Event, in Orlando, February 8, 9, and 10. Learn how to build a Million Dollar Marketing Platform, delegate business tasks to others, and take your business marketing seriously. The conference features speakers who excel in marketing, videos, and podcasts. *To get $100 off your ticket, use the coupon code ‘Podcast’ at checkout.